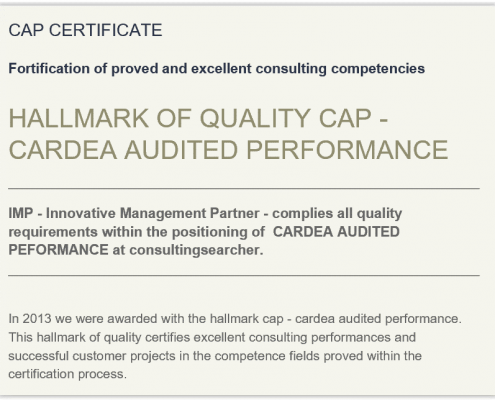 The Cardea quality certificate cap – cardea audited performance for consulting firms is an independent assessment of a consulting firm’s ability to deliver quality work and value to clients. Consulting companies will be awarded with the hallmark if they successfully pass the quality audit carried out by Cardea which is based on a methodology for evaluating the quality of a consulting firm’s work and performance in they eyes of its clients. 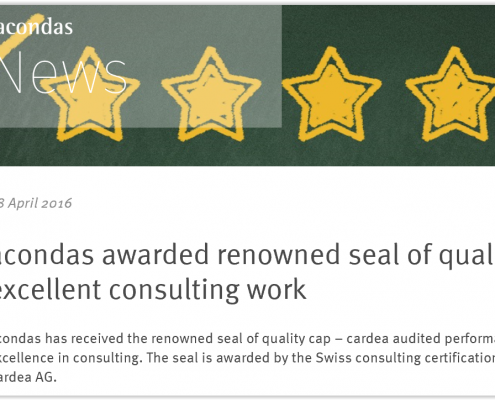 To be awarded with the certificate cap – cardea audited performance consulting firms have to demonstrate proven capabilities and performance. The principal methods of measuring a consultant’s quality are client satisfaction surveys and performance assessments. Whether a client decides to assign a mandate to a consultant, is increasingly dependent on which evidence of abilities and skills a consultant is able to demonstrate. CAP-certified consultants have gone through and passed an independent and objective assessment of their ability to deliver quality work and value to their clients. The assessment is based on ‘real’ (= successfully accomplished) projects and includes both the performance of the consulting firm and of its individual consultants. 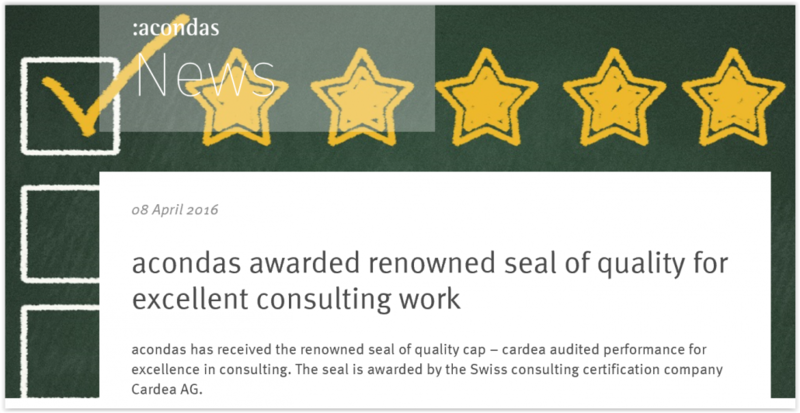 That’s why the Cardea quality audit and certification are unique and provide solid and credible credential that illustrates a consulting firm’s core competencies, expertise and proven track record. Today, clients may have quite an exact idea of what assistance they need for their projects. They search for consultants and capabilities which exactly match these requirements. That’s why it is increasingly important for consulting companies to convey their core competences and values. A clear and distinct positioning that shows the unique ability and customer value of a consulting firm is so important to professional services buyers, since it allows them to seek out professional services providers who have achieved a high profile and outstanding reputation in their marketplaces. Indeed, it’s a critical part of what makes a certain expertise accessible and therefore visible. 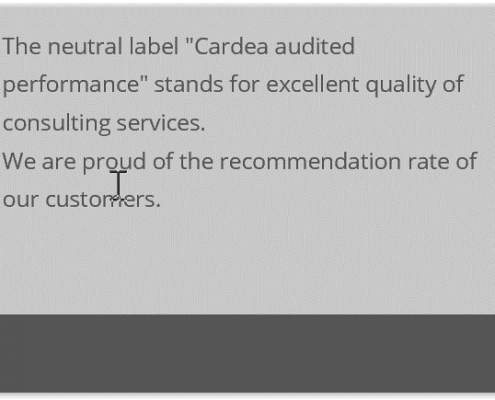 The Cardea quality certificate raises clients’ perception of expertise and reputation and engenders confidence among buyers of consulting services. 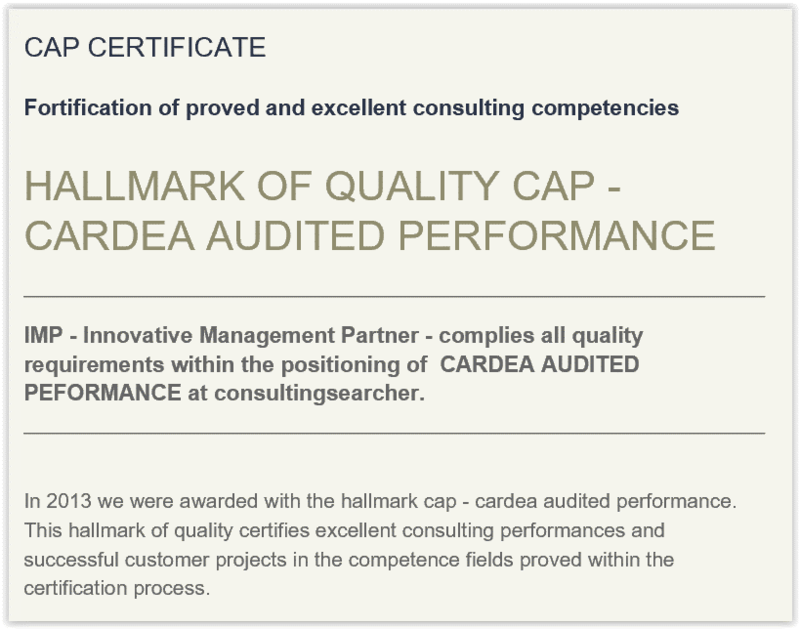 Would you like to learn more about how you can get awarded our certificate cap – cardea audited performance? We’re pleased to provide more information about the certification process and its benefits.